United Way of Sumner County encourages local businesses, civic clubs, churches and other groups to get involved in their communities by registering volunteer teams to help tackle a variety of improvement projects for local non-profit health and human service agencies. 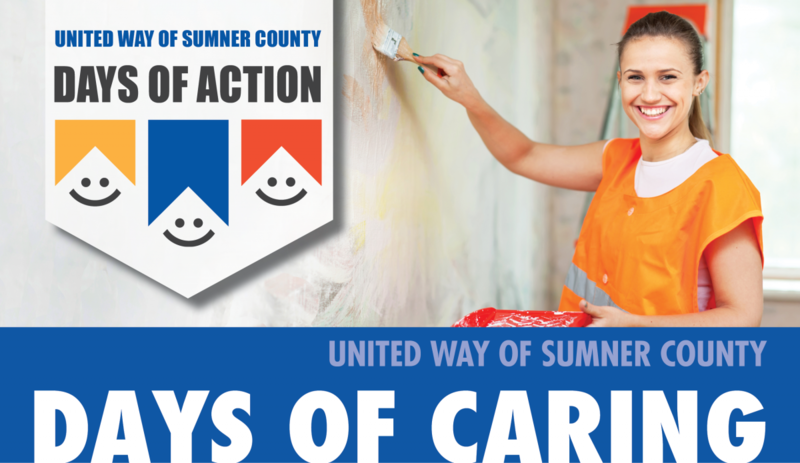 Called Days of Caring, United Way of Sumner County will match volunteers with a variety of projects needing attention at United Way of Sumner County partner agencies. Examples of work to be accomplished include landscaping, storage organization, painting, and more. Volunteer teams can sign up for work hours convenient to them, and United Way of Sumner County (UWSC) will match them with the appropriate partner agencies and projects. While there is more than enough work to go around and keep volunteers busy, Days of Caring is much more than just a community service project. In addition to helping our partner health and human service agencies accomplish projects that will enhance their ability to meet client needs, Days of Caring provides businesses, civic clubs, and other groups with a great opportunity for team building and fellowship. Not only are these projects a great way to give back to the community and to build relationships, it also gives volunteers a personal look at how our partner agencies make a difference in the lives of Sumner County residents. Days of Caring is truly a win/win activity for everyone involved. If your organization is ready to make a difference in our community, registration for Days of Caring is easy. Contact United Way for more information. If your business or group has not been involved with Days of Caring in the past, this is a great year for you to find out what it’s all about. We need everyone’s help to make Sumner County a better place to live for all of us, and every person who takes part in Days of Caring will go home from their project knowing that they have made a difference. 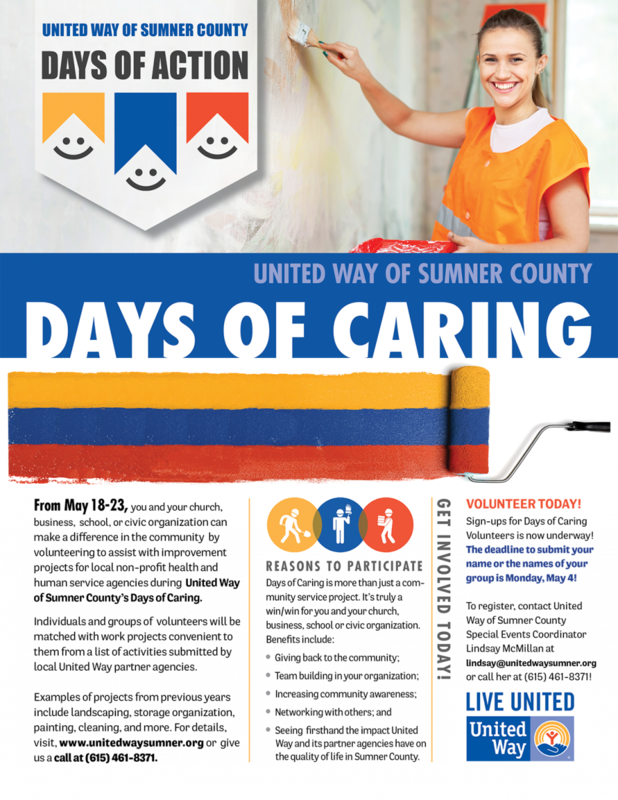 For more information about scheduling a Days of Caring activity and United Way of Sumner County, call (615) 461-8371.